It's time for another Wedding Workspaces, and this month, we're sharing our sixth installment with another fab local wedding pro! Through Wedding Workspaces, we are showcasing Hampton Roads-based wedding pros and where they create throughout the week when not on location for a wedding. Weddings never are one-day gigs; it typically takes months and days to be part of that special celebration... so we might as well feel cozy for the day in, day out tasks! 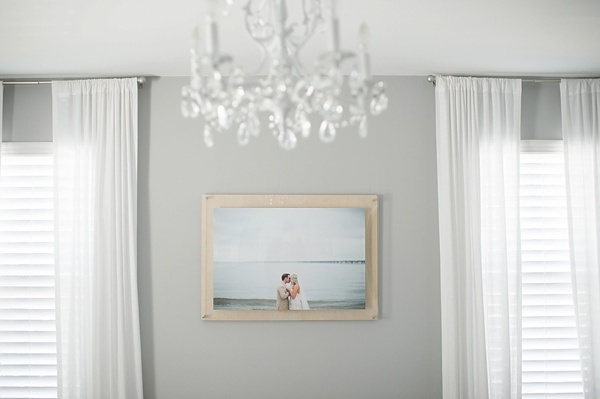 And today, we have contemporary classic wedding photographer and vendor fam Sarah Street of Sarah Street Photography and her modern gray photography home office in Chesapeake. 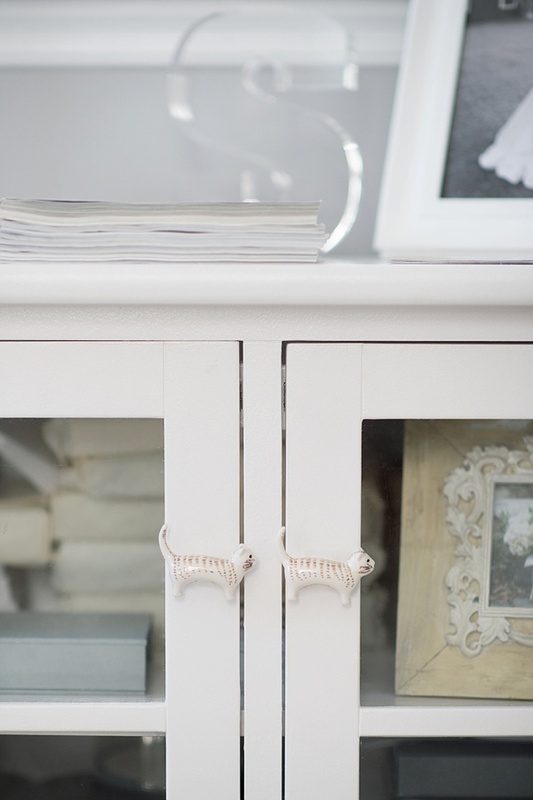 Through soft white accents and a touch of kitty inspiration, this space is meant for tranquil relaxation alongside steady productivity. What was your inspiration for the space? The inspiration for my space was my logo. Very simple, clean, and light. I had already established my logo when I moved into this home office space. What I didn't have was everything else. No furniture, no frames, no light fixtures. It was a blank slate! 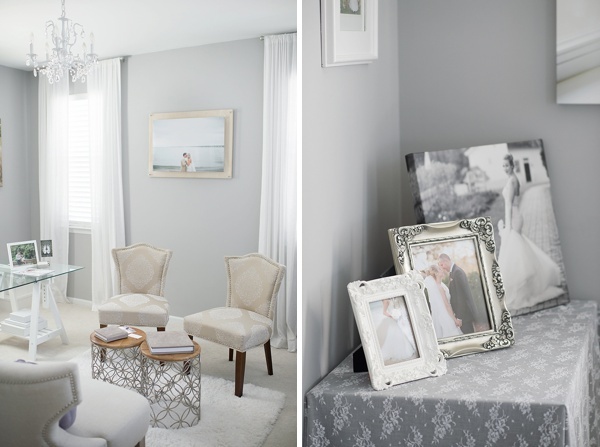 I have a small obsession with the color grey and knew the walls would be that color. A few months and too many grey paint samples later, I finally had the base. I knew I wanted a light and fresh space to display some of my work that complemented my photography style. It has been a three year process of slowly adding pieces and rearranging furniture to get it looking the way I wanted it to. Give three adjectives to describe how you want your clients to feel coming into your workspace. I want my clients to feel comfortable and tranquil, but I also wanted there to be a sense of femininity and romance in the air when they come into the space. What's your favorite part of the workspace? My absolute favorite part of the office is abundance of natural light it receives all day! It creates a happy and inviting environment to work in and visit with clients. Do you have any interesting locally based details in your workspace? The furniture and decor was picked up here and there over the past few years. One locally based detail is the chandelier. I purchased it from Cody's Lighting & Repair in Hampton. A true mom-and-pop establishment. The fixture was in disrepair when I found it upstairs in their shop. After some elbow grease, paint, and new crystal pieces, it was looking good as new. It is one of my favorite pieces and makes for a nice focal point in the center of the room. Have any personal stories of designing, building, or creating? I love DIY! The storage cabinet I purchased used and gave it a fresh coat of paint. As a cat mom, I wanted to incorporate a little of my own personality and replaced the door pulls with cute cat knobs I picked up at Anthropologie in Virginia Beach. I had a difficult time finding a desk that didn't feel bulky as I was going for an airy feel. I came across the sawhorse legs at Ikea and paired them with a custom cut piece of glass from a shop two miles from my house. I was able to size the desk exactly how I wanted and needed it to be for the space. I also love to draw and paint. My own wedding dress was inspiration for the sketch on the homemade easel. I now use the sketch on branded thank you cards, that I print here at home. The large floating frame my husband and I built together, which makes it extra special to me. It makes for a unique focal point on that wall. You can get to know Sarah and her wedding work on Facebook and photography captures on Instagram.